Heat broiler. Split chile peppers lengthwise in half; discard stems and seeds. Place cut side down on foil-lined baking sheet. Broil 3 to 4 inches from heat source until skin blackens, about 8 minutes. Wrap chilies in the foil; set aside to cool 5 minutes. Unwrap chiles; discard blackened skin and cut chilies into strips. Meanwhile, heat a large nonstick skillet over medium-high heat. Add oil, then onion; cook 4 minutes, stirring occasionally. Beat together egg whites, eggs, salt, cumin and paprika; add to skillet and cook 1 minute, stirring constantly. 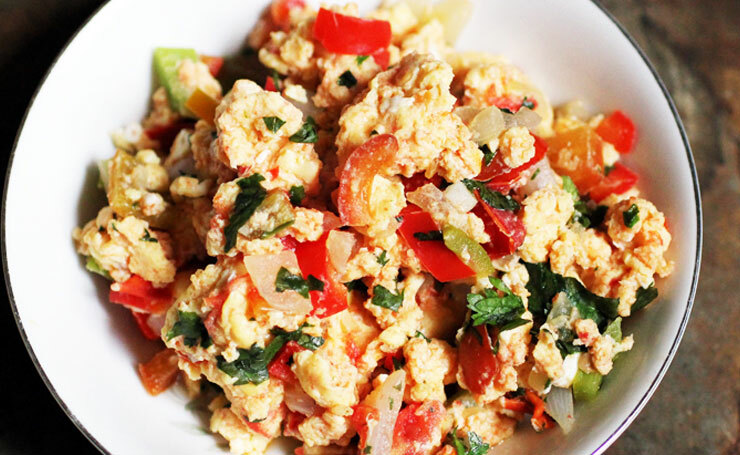 Stir sliced chilies, olives, raisins and parsley into egg mixture; continue cooking until eggs are desired doneness. Serve over pita bread. Good, rich, plain yogurt, especially soy yogurt and pickled capers (which are, actually, flower buds!) are other flavorful toppings to make this intriguing dish even better. 1 3/4 cups egg substitute may replace the egg whites and eggs without any loss of flavor.